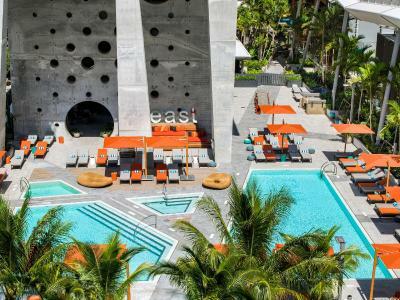 Lock in a great price for EAST, Miami – rated 9 by recent guests! 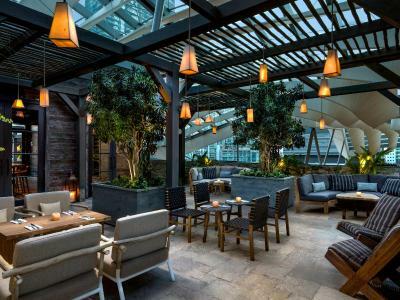 -The rooftop bar is excellent, beautiful view, a very tropical urban feeling. -The rainshower (and hotelsoap) are so nice! Loved the waterfall showers and the balcony views. Great bar staff. Sugar and the Tea Room were great. 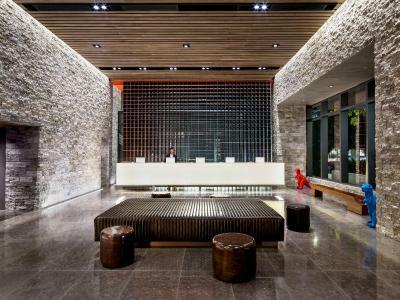 The hotel is beautiful, modern and comfortable at the same time. 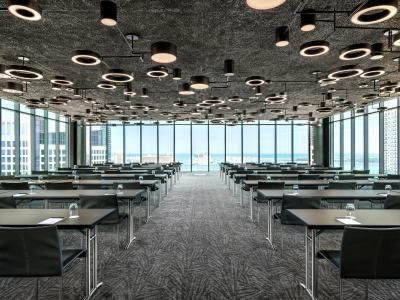 It is also a great location for people on business. Room spacious and clean, big shower and closet space. 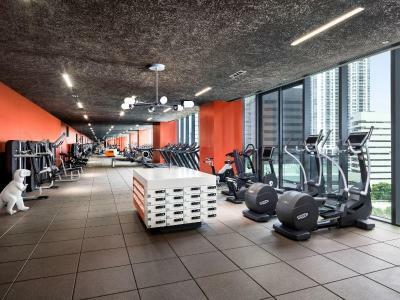 Great location in Brickell. Swimming pool, Jacuzzi, balconies in rooms, rooftop bar. Amazing hotel, I'll be back! What’s not to like!! The hotel is beautiful and super comfortable. The staff was wonderful, especially Nestor in security. I forgot my credit cards and jewelry in my room after I checked out and Nestor retrieved them for me and made sure they were returned to me. 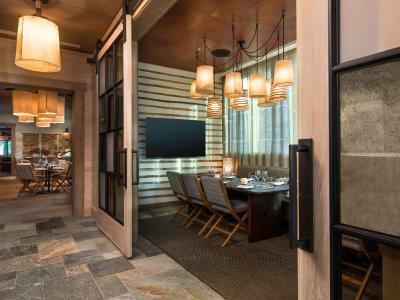 The on site restaurant was delicious, there is a hot club on the roof, it is located in a great upscale shopping mall. 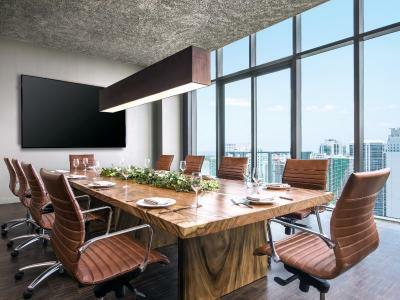 EAST, Miami This rating is a reflection of how the property compares to the industry standard when it comes to price, facilities and services available. It's based on a self-evaluation by the property. Use this rating to help choose your stay! 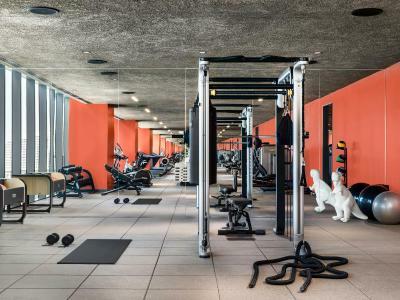 One of our top picks in Miami.With 4 pools, an on-site restaurant, and a 24-hour fitness center, there's something for everyone at EAST, Miami. 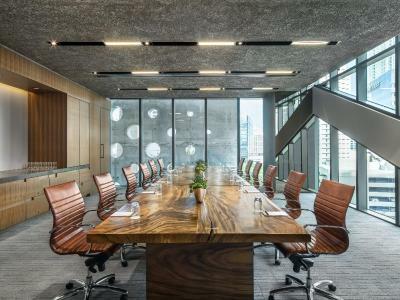 Located in Brickell City Center, EAST, Miami offers premium retail shops, a movie theater, restaurants & bars, spas, and more. 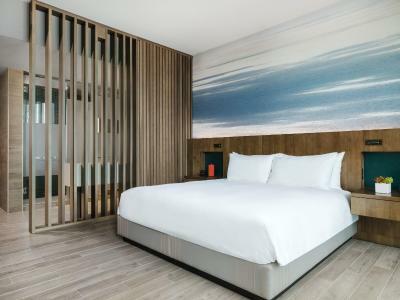 Rooms and suites offer elegant decor with modern accessories, including floor-to-ceiling windows, a walk-in rain shower, and complimentary WiFi for guests. 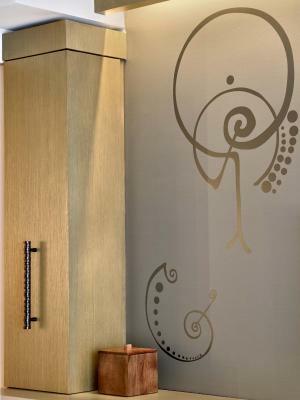 Each accommodations houses a spacious balcony and en suite tea and coffee-making facilities. 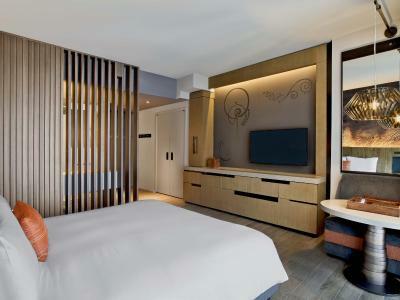 All rooms include 50-inch, flat-screen TVs. 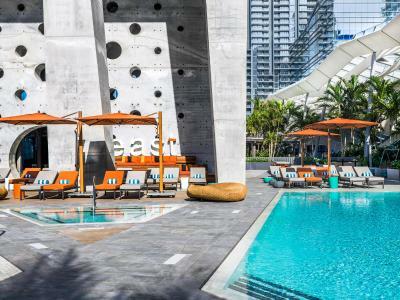 The 20,000-square-foot outdoor pool deck features 4 unique pool experiences, which include a lap pool, spa pool, cold plunge, and hot tub. 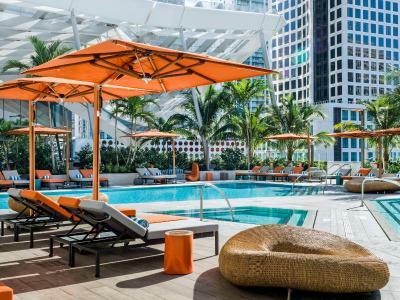 Enjoy city views of Brickell from the 40th-level rooftop bar, Sugar, or explore the light snacks and beverage options of Domain lounge. 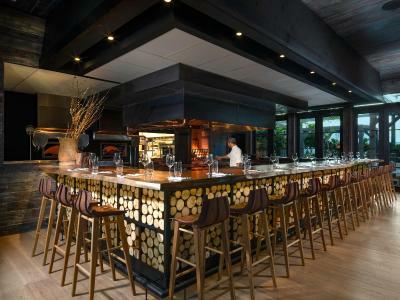 Guests can taste authentic Uruguayan fares at East, Miami's 5th-level restaurant and bar, Quinto La Huella. 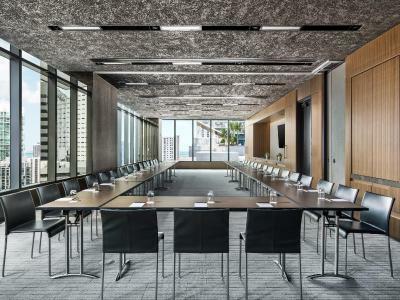 The exhibits of the Perez Art Museum Miami and the American Airlines Arena are within a 1.9 miles’ drive from the property. 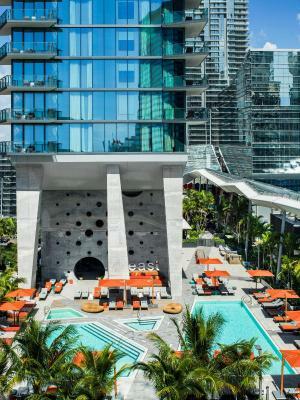 The shops, restaurants, and nightlife of South Beach are 15 minutes’ drive from EAST, Miami. Miami International Airport is a 7.5 miles’ drive. 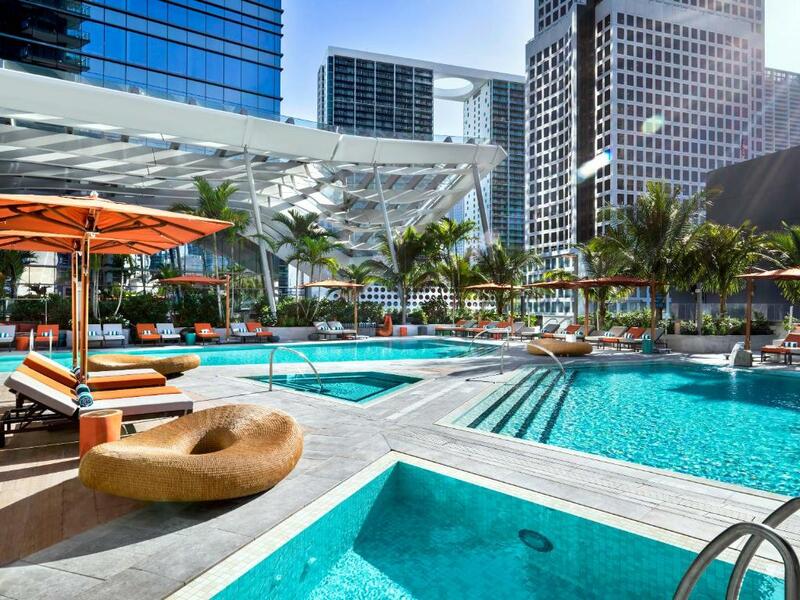 When would you like to stay at EAST, Miami? 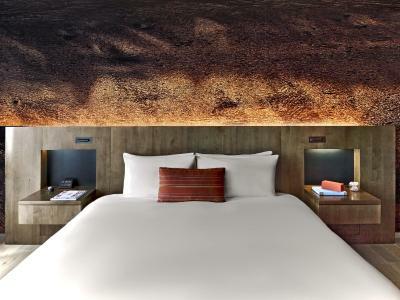 The Urban King Room includes a full-sized work desk, content streaming, and a fully stocked mini-bar. 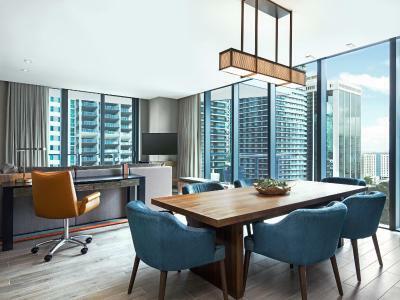 Additional luxuries include floor-to-ceiling windows, bath amenities, and spacious balconies that offers views of Brickell and Miami city center. 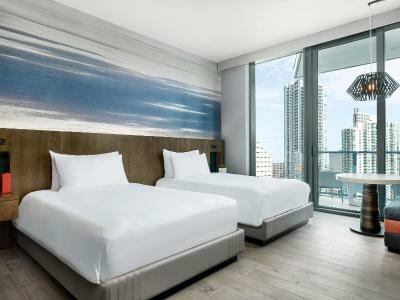 The Urban Double Room features floor-to ceiling windows, city and bay views, and en suite content streaming via the 50-inch smart TV. 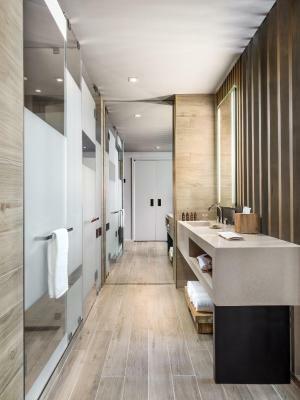 The room includes energy-efficient options as well as luxury bath amenities and free WiFi. 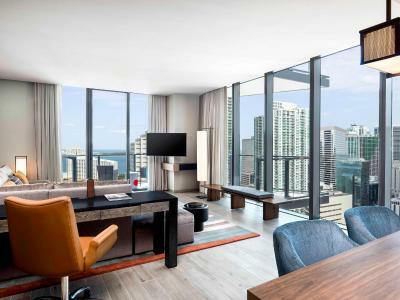 The Corner King Room features a wrap-around balcony, floor-to-ceiling windows, and city views. 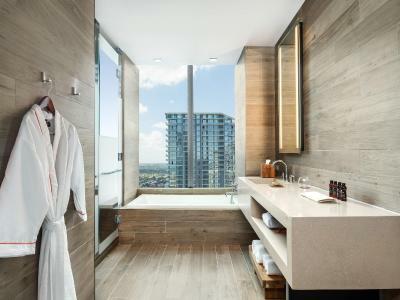 The room includes energy-efficient options as well as a spacious, five-foot bath. 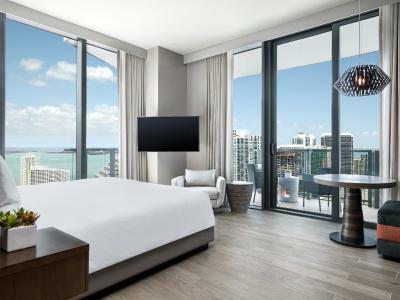 The Bay King Room features a wrap-around balcony, free WiFi, and floor-to-ceiling windows that highlight Key Biscayne and the Port of Miami. 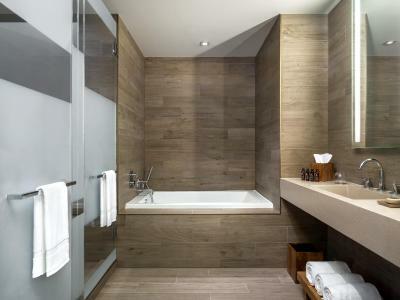 Guests can stream content on the 50-inch smart TV or unwind with en suite bath amenities. 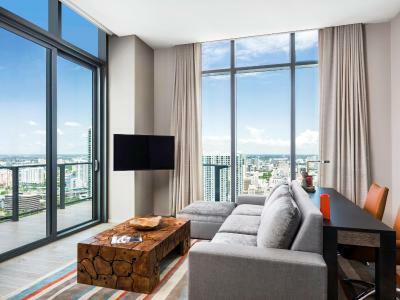 One Bedroom Suites are located on the 36th level and feature a seating area, 1 and 1/2 bathrooms, and city views. 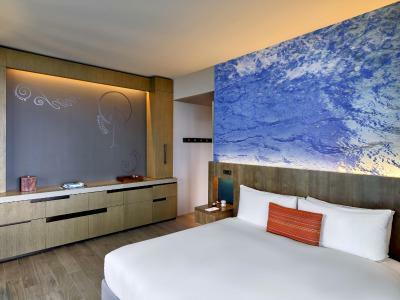 Suites include a mini-bar, bath amenities, and two 50-inch smart TVs. The Jr. Residential Suite offers a fully equipped kitchen, a seating area, and a walk-in closet. 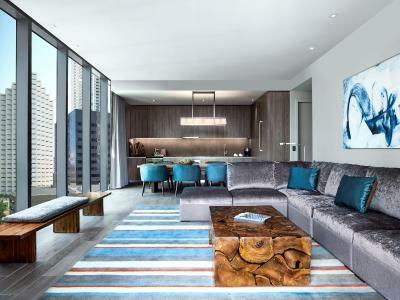 Additional features include floor-to-ceiling windows, spacious balconies, and a washer and dryer. Residential suites are accessible through a separate lobby elevator. 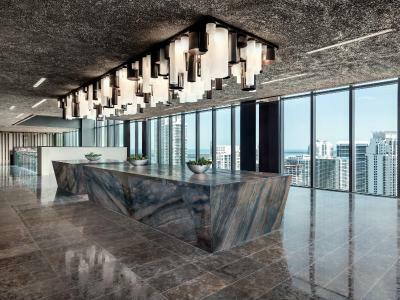 This south-facing suite offers views of Brickell and Miami. It includes a fully equipped kitchen, a seating area, and 1 and 1/2 bathrooms. A washer and dryer are also provided. 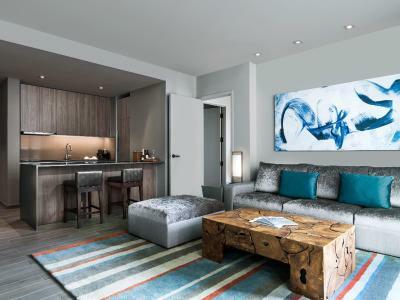 The Two Bedroom Residence Suite features a seating area and fully equipped kitchen. 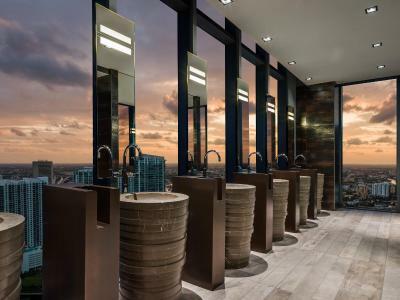 Three 50-inch smart TVs are provided, as are bathroom amenities. 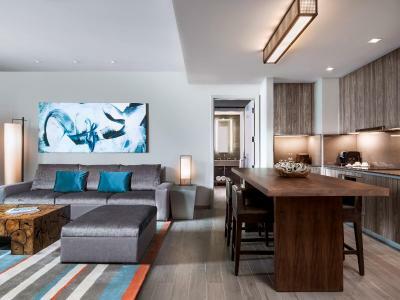 This spacious suite includes a separate seating area, fully equipped kitchen, and four 50-inch smart TVs. 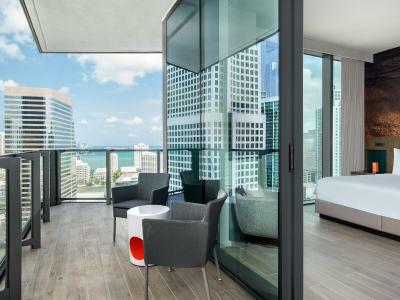 The wrap-around balcony offers views of Biscayne Bay. This apartment features a balcony, view and microwave. 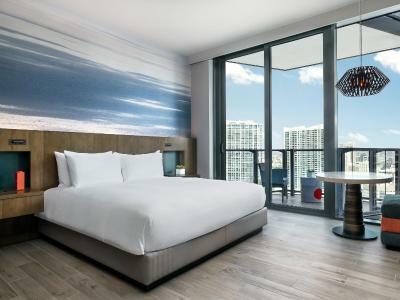 EAST, Miami, the anchor hotel for Swire Properties’ $1.05 Billion, 5.4 million square foot mixed-used development, and the first of its kind for the Hong Kong-based brand in the United States, features destination dining, state-of-the-art fitness facilities, cutting edge technology, and quality amenities available to both local residents and visitors to Miami. 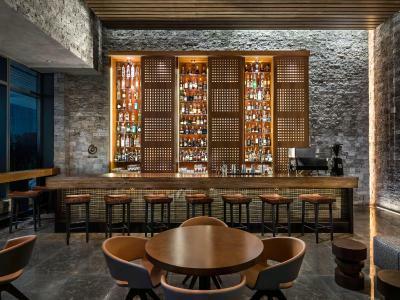 The hotel offers a distinctive and unconventional experience for individuals who seek innovation, style and personalized service, building upon the success of the EAST brand, which includes EAST, Hong Kong and EAST, Beijing. 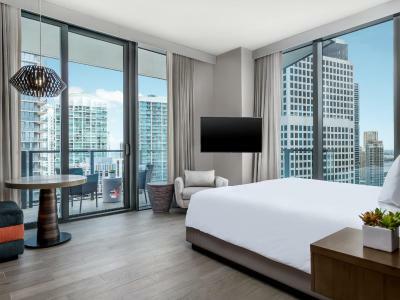 EAST, Miami offers 352 guest rooms to include eight suites and 89 residence suites all owned and operated by Swire Hotels. 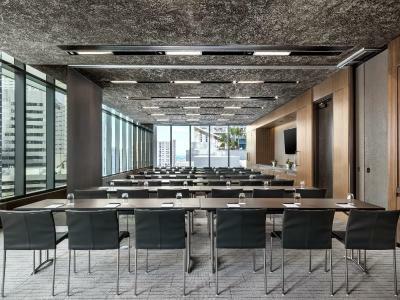 Ranging in size from 300 to 1,800 square feet, the contemporary rooms, suites, and residence suites feature balconies with views of the Miami skyline and Biscayne Bay, floor-to-ceiling windows, walk-in rain shower, and complimentary WiFi. 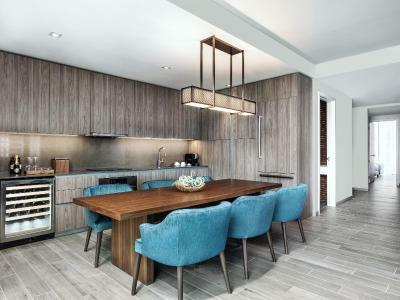 The one-, two- and three-bedroom residence suite options also offer fully equipped kitchen and laundry facilities along with access to all amenities and services of the hotel. 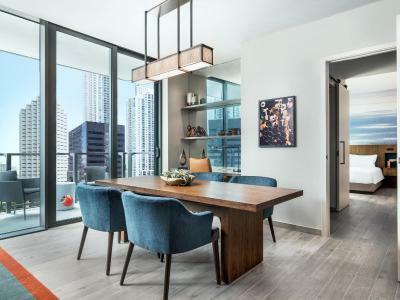 House Rules EAST, Miami takes special requests – add in the next step! Any additional children or adults are charged USD 40 per night for extra beds. EAST, Miami accepts these cards and reserves the right to temporarily hold an amount prior to arrival. Please note that a security deposit of USD 150 per night must be paid on arrival. This will be returned at check-out, subject to a damage inspection. Pets must weigh 25 pounds or less. The property charges a package handling fee of USD 10 per package. 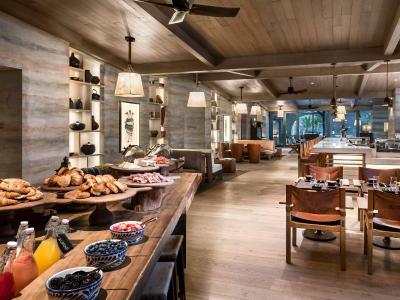 Please note that if the Breakfast Included Rate is booked, breakfast is only included for 2 adults. Elevators can be a little confusing at times. Somethings are always a problem. Ice maker, checking your bill on tv. The loungers are stained and dirty by the pool with some having cigarette burns We witnessed guests being allowed to eat pizza in the hot tub on Saturday afternoon- totally unhygienic! The USB charging ports did not work in the room and we reported this issue twice The hair dryer in the room was broken but was replaced when we reported it The food in Quinto was passable but by no means excellent as would be expected, we ate two excellent meals at North Italia and many lessons could be learned from there by both chefs and waiting staff. The wait time for the front desk (in person) is a little longer than I am used to. They front desk staff is amazing! They may just need a extra person or 2 during busy times. Extremely chic and modern. Definitely a luxury hotel. The staff was amazing! The property does a great job at keeping it clean and up to date. The pool area is amazing. While I don’t remember the name, the same lady checked me in and out. I was very happy with my reception, when I left she couldn’t print out my receipt as the computers were rebootin, hope ahe’ll Send it by mail later. The staff take to long to come to you. It took them 2 hours just to bring something we had to keep calling . No ice on our floor ,no vending machine .Too clean and nice looking to lack in special areas. Staff expects you to tip them way too much. We were charged for things that were left out as complementary. 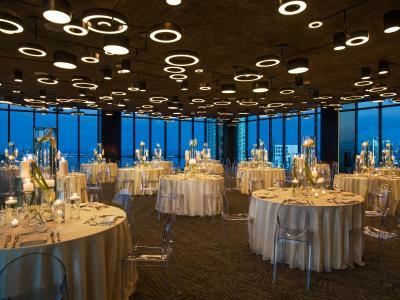 Great location, beautiful view from the balcony of the room on the 35th floor. 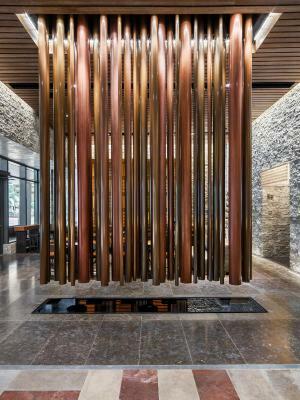 The overall design of the hotel.